These quintessentially fall pumpkin doughnuts are baked, not fried — which means we can almost call them healthy, right? For this family treat, I used a King Arthur Flour recipe — outstanding on its own — and added a little burst of maple for fun. Beat together the oil, eggs, sugar, pumpkin purée, maple extract, spices, salt and baking powder until smooth. Add the flour, stirring just until smooth. Fill the wells of the doughnut pans about 3/4 full; use a scant 1/4 cup of batter in each well. Bake the doughnuts for 15-18 minutes, or until a toothpick inserted into the center of one comes out clean. Remove the doughnuts from the oven. After about 5 minutes, loosen their edges and transfer them to a rack to cool. The original recipe calls for these doughnuts to be dipped in cinnamon sugar — which sounds delightful — but I chose to serve them warm from the oven with just a sprinkle of powdered sugar. 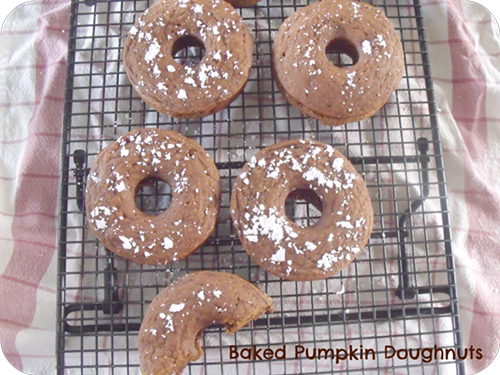 Check out the original recipe for King Arthur Flour's Pumpkin Cake Doughnuts for more details on making the perfect pumpkin doughnut and if you want to add the cinnamon-sugar coating.